Please refer to our stock # 3029 when inquiring. 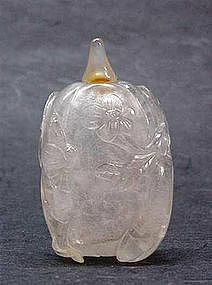 This interesting hand carved rock crystal snuff bottle is 2 ½ inches tall, 1 5/8 inches wide and 1 inch thick. It depicts a butterfly flying in front of a squash and its flower. The snuff bottle is well hollowed and polished. It has a cone shaped agate top. The crystal has natural grains and impurities.